The new Club Penguin Island Daily Challenges have been released but they’re repeats of TWO previous ones. Furthermore, there’s a bug which makes it seem like there’s no community challenge but there actually is. Let’s take a look. This challenge is very simple. Head over to the west of Beacon Boardwalk and go up to the food place. Click the orange “!” button to sit down on this bench. Then simply just say something. It doesn’t matter what as you’ll still be able to claim your reward! There doesn’t even need to be any other penguins there. Unfortunately, this was a repeat of a previous challenge. Unfortunately, we have a repeat challenge again. Members need to head over to the Welcome Market by the Welcome Circle to purchase a “Party Blaster Jr” for 100 coins. This can then be used by tapping the party hat at the bottom, tapping “party supplies” and then tapping the name of this item. Don’t use it just yet though! The challenge is to use it by an anchor. This can be found near the steps towards zip line at the east of the area. Once you are close the anchor, fire the party blasters to be able to claim your reward. This challenge is actually a bit misleading because it’s a community one. You’ll need to find three other penguins to help you. Once you have, head over to the Welcome Circle in Beacon Boardwalk. Wait until it is empty and the mosaic appears. You’ll see a compass in the middle of the floor. 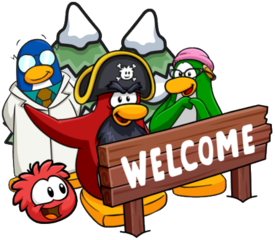 Get all four penguins to be on a different side of it like in the image below to claim your reward. Head over to the Lifeguard platform in Coconut Cove. This is just passed the Stage. Waddle up to the lifeguard kit and tap the orange interactive button to equip it. At the bottom of your screen, there’ll be a binoculars icon in blue. Tap that to be able to claim your reward. These were the Daily Challenges for today and I must admit, I am extremely disappointed. Hopefully they’ll get better soon and hopefully this guide helped you! 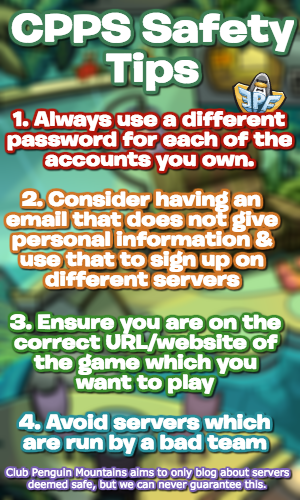 Be sure to check back for news along with guides!